I discovered that I love Mountain Biking even the whole getting covered in mud part; I definitely intend to make this a regular part of my life. I re-discovered the love and enjoyment I had for dancing when I was a child. I also realised how much I enjoy group activities and no longer feel like I’m a liability to my team. An absolutely remarkable woman who began the most incredible health and fitness journey four years ago with her trainer Kate Lugtigheid from Pumped. 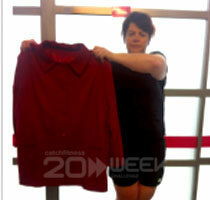 Gini dropped 50kg in her first year of training with Kate and has since gone on to lose another 12 kg! She is fit (has run seven half marathons) healthy (eats clean), strong (can leg press over 200kg) and determined! Gini had a 475% increase to her sit and reach test, 50.88% to her V sit and reach, she can now get her palms flat to the floor and she has increased her calf flexibility between 42-44% also! Gini made a conscious effort to stretch every day and as a result she can almost do the splits again! One of the two categories that I entered in the challenge was the adventure category. My goal with this category was to try 20 new activities throughout the 20 Week Challenge, with the end outcome was to find new hobbies to substitute with running which my knees required me cut back on. While some may not consider these to be great adventures but for me they were, they got me well and truly outside of my comfort zone and trying new things. Some adventures were more successful than others, there was not one that I didn’t enjoy or regretted doing, in fact almost all I would do again. I discovered that I love Mountain Biking even the whole getting covered in mud part; I definitely intend to make this a regular part of my life. I re-discovered the love and enjoyment I had for dancing when I was a child. I also realised how much I enjoy group activities and no longer feel like I’m a liability to my team. There is no way that I would have successfully completed this challenge or my whole journey over the past four years without the wonderful support of my parents or my trainer Kate. My parents have continuously supported and encouraged me along the way especially my mother, who has come along to many of the events that I have entered to cheer me along as well as massaging many a tired and sore muscles. It has been a rocky road for me throughout 20 Weeks, resulting mainly from the negative thoughts rumbling around in my head. But if I weigh up all the ups and downs that have happened along the way, the highs certainly outshine any low points. The greatest success for me over 20 Weeks was the amazing things that I learned about myself and well as finally accepting and learning to live with some of the negative things. I believe that I have now finally let go of all crap that leads to someone weighing 136.7 kg that girl is gone and she is NEVER coming back!!!!!!!! WOW! Sums up Gini in one word! 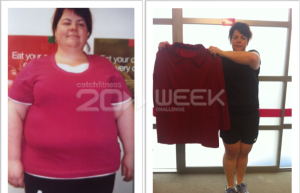 I have been training her for the last four years and in the first year she lost 50 kg. It has since been a mental barrier of hers to crack the 60 kg mark and this challenge was a success in itself because she achieved this! Gini is the most dedicated and committed person I know! She inspires me to be better and strive for more as she is such a motivated person! This challenge has been one of the highlights for me from the whole time I have known Gini! I think it was because one week we had a moment as things weren’t going to plan, it was getting hard and the results weren’t happening, that day it was going to go either 2 ways, Gini could’ve quite easily thrown it away completely or she would step it up a notch and go for it! 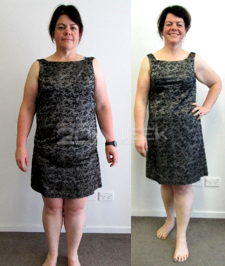 She chose the second option and by the next week there had been such a phenomenal turn around as she achieved the 60kg weight loss mark! Gini is now the happiest I have ever seen her! She radiates energy and she has continued to inspire ALL of my Pumped Athletes with her amazing success! I am so proud of Gini, her effort this challenge and I am so grateful that she got to reach a goal that has been a long time coming! Gini was trained by Kate Lugtigheid who was winner of the Best 20 Weeks PT in 2012 and was a finalist in 2013.